FastBraces® is the latest technology for straightening crooked teeth in a significantly reduced time over traditional braces. The treatment time involved with FastBraces® can be anywhere from 3 months to a year. Dr. Heidari and The Creek View Dental Group here in Aptos is a provider of this orthodontic treatment option to patients who have teeth alignment and/or teeth spacing issues, but may not want to wear regular braces. Because treatments take less time with FastBraces®, treatment is more affordable and often times can be just half the cost of traditional braces. Dr. Heidari earned his FastBraces® certification and can quickly help you determine whether this form of treatment is appropriate for you or your loved one. Traditional braces would begin the teeth straightening process by moving the crown of the tooth in the first year, and the root of the tooth in the second year, thus requiring two or more years of treatment time. FastBraces® on the other hand, moves both the crown and the root at the same time, which makes it possible for treatment to be completed in as little as one year, and in some cases just a few months. This is the original bracket system that revolutionized modern orthodontics. 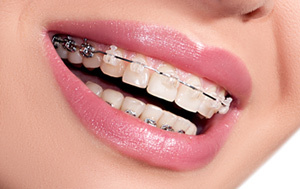 The Standard Metal braces offer significant benefits and results in as little as 20 weeks. The Ceramic Clear brackets offer the same advantages as the Standard Metal™ brackets, while providing a more natural appearance. The ceramic brackets and wire are less visible and blends in with your natural tooth color. If you have limited time to straighten your teeth, FastBraces® Turbo™ may be the ideal solution for you. It offers all of the same benefits as the other treatments but in much less time. Have a crooked smile? Contact us today to get straighter teeth in half the time! Call now 831.688.6531 or email us at Info@CreekViewDentistry.com . We look forward to helping you get that beautiful smile you’ve been wanting.